July 23, 2018, 1:31 PM · What happens when you see a Ferrari? I'm not talking about one on TV or on YouTube. What happens when you see a Ferrari in real life, driving on the street? Granted, there are a limited number of communities on this Earth where you might have the good fortune to catch a Ferrari running in the wild. But I will tell you what happens: Heads snap. People conjure their mobile phones. Local Instagram traffic spikes. And the same goofy grin appears across the faces of everyone on the sidewalk, as the roar of this ridiculously expensive Italian sports car calls to adults as the bells of ice cream trucks did in their youth. So how can a theme park make that magic moment last all day? Ferrari World Abu Dhabi knows how to cast that spell. I was invited to the Yas Island entertainment resort in Abu Dhabi this week for the grand opening of Warner Bros. World, which debuts to the public on Wednesday. But today, organizers brought us to Warner Bros. World's sister park, Ferrari World, which has been welcoming guests to Yas Island since 2010. This was my first visit to Abu Dhabi, but as home to the world's fastest roller coaster, Ferrari World has stood near the top of my theme park wish list since its opening. But is there more to this park than a coaster that launches so fast, they make you wear goggles when riding? Filling more than 21 acres, Ferrari World Abu Dhabi is more than four times the size of Las Vegas' Adventuredome, which is the indoor park probably most familiar to American theme park visitors. And that's not counting the three roller coasters that run outside the Abu Dhabi park: Fiorano GT Challenge, Flying Aces, and Formula Rossa — the world's fastest coaster. Let's start there. An Intamin hydraulic launch coaster with the equivalent of more than 21,000 horsepower, Formula Rossa is actually 20 times more powerful than the Formula 1 beasts that inspired it. Of course, it needs to be, to haul 16 riders across its mile-and-a-quarter track, as opposed to the single driver the F1 car carries. Reaching its top speed of 149 mph in a smooth four seconds, Formula Rossa doesn't send it riders up a towering Top Hat, as so many other Intamin Accelerators do: Xcelerator, Storm Racer, Top Thrill Dragster, Kingda Ka. No, Formula Rossa runs you instead up a relatively modest 170-foot hill that barely scrubs your speed. And that's the point. Remember that magic moment? Formula Rossa isn't trying to offer the fastest version of a coaster you've probably ridden at a handful of other parks already. It seeks to create the unique magic of sitting in an F1 race car, in full anger. The launch gets the headline, but for me, Formula Rossa comes alive when it dives back toward the ground, hugging the Earth through one high speed curve after another, as if I'm finally getting to drive Eau Rouge at Spa-Francorchamps. I love that Intamin and Ferrari World completed the theme by crafting a coaster train with a F1 nose, helping sell the narrative that you're on track in a race car and not just riding another roller coaster. The aforementioned goggles also reinforce the theme, though they also provide a very needed function, as well. Trust me, you do not want scorching desert air blasting your eyes at nearly 150 mph. Yes, the heat of this coaster can be intense, especially after lounging inside the blissful air conditioning of the park. But just imagine yourself wrapped in a Nomex firesuit like Sebastian Vettel, sweating through another afternoon at the track. Or just remember that coasters run faster in the heat and give thanks that you've now experienced the ultimate, as a result. Across the park, Flying Aces recreates the another thrill, that of flying a World War I biplane. What does that have to do with Italian sports cars, you ask? The queue tells the story: Italy's top ace, Francesco Baracca, honored his former cavalry regiment by having painted on his plane a black prancing horse. A decade after his death in combat, Baracca's parents presented the emblem to Enzo Ferrari, asking him to place it on the cars of Scuderia Ferrari as good luck. And that is how a World War I biplane gave Ferrari its famous logo. You don't need to know that story to appreciate the fun of this Intamin coaster, which dashes up its chain-lift hill before diving 200 feet into a heart-shaped non-inverting loop. Again, there's another well-themed decoration at the front of these trains, in the form of a biplane's propeller. And the train honors the biplane theme with a two-layer seating arrangement. The middle two seats in each row sit atop the track, while a floorless seat on each side sits a step below. Choose one of these wing seats for the more thrilling experience, as Flying Aces maneuvers through its series of well-banked twists. Just as the ride turns back toward the building and convention dictates we finish with a bunny hop or two, Flying Aces throws its final surprise: a heartline roll that leaves you hanging in the air. Ferrari World's third outdoor coaster, Fiorano GT Challenge, might be considered Formula Rossa Jr. (Racing geeks who wish to take that comment as an invitation to launch a flame war over the merits of GT versus F1 racing, feel free.) Though its top speed of 59 feels almost leisurely after Formula Rossa's, this Maurer Rides racing coaster does offer multiple launches across its 3,200-foot track. (Is that a LSM Launch or a trim brake up ahead? Let's play "Do You Know Your Coaster Tech?") Ferrari World was running just one train on one track, so no racing, though the ride was pretty much a walk-on the time I was there, so I can't blame them from going light on capacity. FWIW, July isn't the high season in the United Arab Emirates, where the daytime highs around 110 are bad enough, but the nighttime low of 95 is just brutal. Thus, the appeal of an indoor theme park. My limited time in the park during a press tour allowed me time for only one other attraction, the Speed of Magic motion-base 3D ride. Featuring Nello, a sassy Ferrari driver whom you'll see also in the park's children's land, Speed of Magic puts you in a race with Nello for the keys to his Ferrari. (As if!) The ride starts on a race car track, but then breaks convention to take us racing through a forest, underwater, down a ski slope, across lava, and through the desert, before returning to a motor racing track with a layout straight out of the Wachowskis’ Speed Racer. Honestly, the motion base on this dark ride challenged my equilibrium more than any coaster I rode today. A lower, themed ceiling might have helped protect the sense of immersion in this adventure, as well. But Speed of Magic offers a smart mix of screens and practical effects, and there's even a moment here that calls back to Walt Disney World's Flight of Passage... except that Speed of Magic opened seven years before Disney's Pandoran masterpiece. With my next scheduled activity looming, I will have to leave until some future visit a trip on the park's newest coaster, Turbo Track. There's a fifth, unannounced coaster on the way, too, though a cobra roll of its track protrudes from a wall inside the building. After that, a new family section of the park is under development, according to park officials. As for the current line-up, I'd also love to ride Benno's Great Race, an interactive dark ride starring the park's cartoon mouse; Viaggo in Italia, a flying theater ride over Italy; and to see some of the park's shows, including the Coppa di Sicilia movie, Red stunt show, and Fast Lane trivia show. And, oh yeah, I'd love to take a ride on the park's Karting Academy go-kart track, as well. 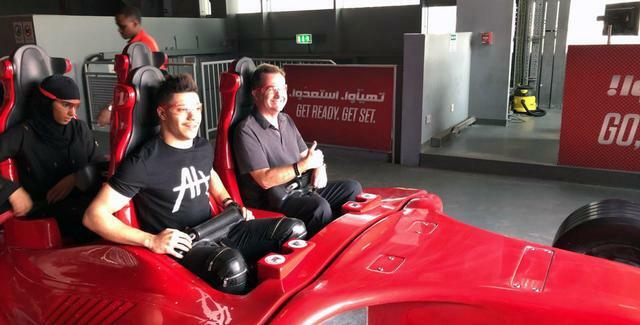 But I had a bigger driving experience waiting for me on our press tour, after my time at Ferrari World. Because I had lingered to ask questions and shoot some video, I missed the bus over to the Yas Marina Circuit F1 facility next door for my scheduled driving time on track... behind the wheel of an Aston Martin GT4. So the park arranged to drive me over in a car. And you just know what make of car that would be, right? As soon as my host opened the doors, heads started snapping. As we pulled from the parking space, everyone in sight whipped out mobile phones to start recording my ride as if I was some previously unknown Kardashian. Oh, who are we kidding? No one even saw me. They were all looking at the car, a flaming red Ferrari California. As a traffic guard turned to wave us onto the road, his hard stare melted into that goofy grin when he saw us. I swear his knees even buckled as he swooned. Actually, I haven't had any of those reactions, when I've seen a Ferrari. I've just thought "nice car" and moved on with my day. I'd like to ride these coasters, but nothing else about this park, holds any interest for me. I honestly wouldn't know it was a Ferrari if it ran over me!! But it's nice to know at least everyone else around me would be saying "Woe! Did you see that Ferrari plow down that woman??" As a Jew I will never be able to visit these parks, which frustrates the hell out of me. Wish theme park companies would spend their money in more inclusive countries. Just hope for video. "If I have to go... please let me go viral." I enjoyed Formula Rossa and flying Aces.. we probably spent a total of 3 hours in the park. Nice and clean... But I wouldn't call it the best theme park. Pretty boring after you ride the coasters.